This composite image shows the motion of the dusty cloud G2 as it closes in on, and then passes, the supermassive black hole at the centre of the Milky Way. 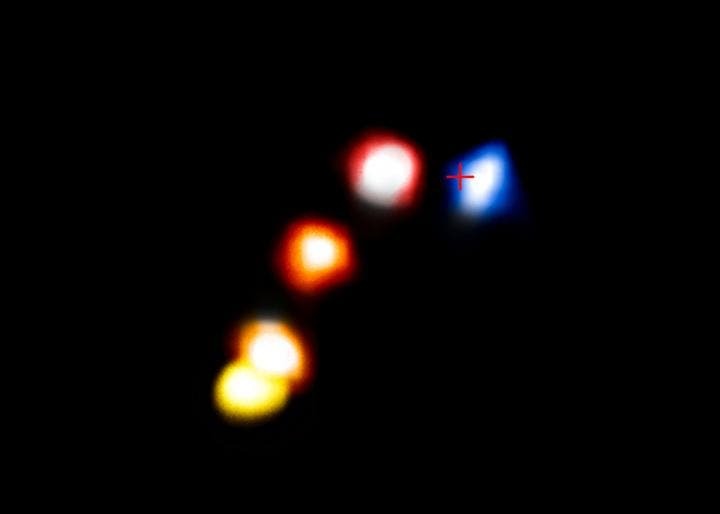 These new observations with ESO's VLT have shown that the cloud appears to have survived its close encounter with the black hole and remains a compact object that is not significantly extended. In this image the position of the cloud in the years 2006, 2010, 2012 and February and September 2014 are shown, from left to right. The blobs have been colorized to show the motion of the cloud, red indicated that the object is receding and blue approaching. The cross marks the position of the supermassive black hole.